i just wanted to send a big thank you again to our generous sponsors this year: 2modern.com, sparkability, growmodern and readymade magazine. you can visit their sites by clicking on their banners below. and a big thank you to the talented julia rothman for creating our 2008 diy contest icon this year. thanks, julia! 1. Clean that suitcase! Febreeze that musty smell! Repair any damage to lining. 2. Measure for pillow. Using a tape measure, measure the width plus the depth of bottom suitcase cavity x 2. This gives you the width of your pillow. Then measure the height (from front to back) plus the depth of the bottom suitcase cavity x 2. This gives you the height. You must add the depth of the suitcase x 2 or else your pillow will end up too small. Believe me I made that mistake the first time! 3. Sew your pillow together. Put right sides of fabric together and sew around leaving about a ½ inch seam allowance. If your suitcase has rounded corners you might want to round the corners of your pillow. Leave an opening for stuffing. Turn pillow right side out and stuff. Sew up opening by hand. 4. Optional: Tuft your pillow. I used two large buttons, heavy-duty thread or upholstery thread and a long needle. Using the long needle sew the buttons on the pillow. Enter the front of the pillow and exit at the back, repeating this over and over. This will make nice tufts and give your pillow some shape and a more finished look. 5. Attach a strap to the back of the suitcase so it will not close on your pet. Place a mark about 4 inches in from the back of the suitcase on the top and bottom of your suitcase. Open the suitcase and measure the distance between these marks, making sure your measuring tape is taut. Cut a strap using that length plus about 1 inch. Attach snap tops to both ends of the strap following manufacturers instructions. Now depending on your suitcase this part is tricky. Improvise if you need to, every suitcase is different. Choose a drill bit that will be just large enough for your snap shaft to fit through. Drill a hole on the top and bottom of the suitcase at the marks you made. Be careful of the suitcase lining. Attach the snap bottom to your suitcase following manufacturers instructions. Like I said this can be the tricky part, you might need to use a craft knife to clean up the hole and make it just right for the snap. Be creative. Once you finish this part, you should be able to snap on the strap and it should keep the bed open and not allow it to close on your pet. It can also be removed when you want to travel or close up the bed. 6. Attach feet. Once again, every suitcase is different; you may need to be creative with this step. I attached the painted wooden dolls heads with gorilla glue to the bottom of the suitcase. Clean the area you are gluing very well and sand the area of the wooden dolls head and make sure it has no paint on the contact point. You may also be able to screw the feet on depending on what you are using. Don’t forget to improvise if you need to! The main objective is to have a comfy cute and unique place for your pet to sleep in. However you arrive at that goal is great! That’s what DIY is all about. congratulations! hey, is there any chance we can get instructions to the other projects as well? this is not a complaint in any way (its a wonderful pet bed! ), just a little bummed that the winner did not take as much original thought as did many others. Congratulations to Kirsten! A great idea beautifully executed! LOVE, Love, love it~ So glad you won, you had my vote! i did some research on this project because some of you emailed about it. i found bed projects like this posted on sites from as far as 2 years back so i think this, and the AT version won’t be the first or last we see. kirsten added details that made this piece her own (and details that weren’t featured on the recent AT post) and that’s what we’re applauding here. Beautiful! I’m thinking about doing this project sometime in the future. The only problem is, to a dog, that looks like a great big chew toy. I think it’s a great idea. And for those of you who had negative comments…. why can’t you just be happy for her and congratulate her. Why do we always have to say negative things to people and bring them down when they should be excited about their win! so does the dog bed. are there instructions for making the cute dog with it, or does that come from somewhere else? Plus it looks like it’s really well constructed, and her colour choice is very nice too (and her dog is damn cute!). I’m totally making one next month when I move into my new apartment. It’s very pretty but come on, really??? Not to sound rude, but I agree with the lack of originality commented above. There were many other amazing, more original and creative projects. Maybe it was the cute dog that did it for voters?! Congrats anyway! Enjoy your prize! kirsten’s dog bed went up on her etsy shop in december 12th 2007, 2 months before the AT post mentioned above. Congrats Kirsten! I love this! I wish I were creative enough to make one. You took something classic and made it into the “now”. Great job! whoo hooo my choice won! I love my mini doxie, and am totally going to make this bed! i think this diy contest has been a big success! the way the comment area was turned into a marketplace the disscussions sometimes emotional, sometimes more informatif. i think that all shows how passionate people get over design and it´s great! topics like safety versus aesthestics, authentizity of ideas, responsibility, what rules make sense, what the culture of lawsuits does to american design, the responsibility of individuals to use common sense…. last but not leat theses are the things that fulltime designers think about every day, all day. and i think it´s a good moment to pay tribute to the professionals and also to congratulate all those who have embarked on tring their hand at making something on their own! AT actually posted their design in February of 2008 – two months after Kirsten posted the bed design on her blog in December of 2007. Her attention to detail and her ability to improve upon what others have done before her is what makes this piece stand out above the others. “There is nothing new under the sun.” No art is created in a vacuum. What makes a piece unique is when an artist takes the inspirations around them and turns them into something that is timely, beautiful, and meaningful. That’s awesome. I’m going to make a bed for my mini doxie too. Congrats!!!! very well put nadja, couldn’t have said it better myself. no pun intended, but the cattiness about the dog bed from different peole isn’t going unnoticed. I’m sure the intent of the contest was to celebrate diy creativity and not spout criticism…Congrats Kirsten! Congratulations to Kirsten – I voted for this project because I thought it really embodied the spirit of a cute DIY project (for me, anyway): something anyone could accomplish in a weekend. And to people bemoaning the lack of originality: I didn’t see any adorable Amy Butler squeaky toy in the AT post! Congrats to Kirsten! The doggie bed is adorable. I voted for the second place winner, but all the entries were wonderful. This is a cute bed, but it isn’t original and I’m a little disappointed in how the vote turned out. AT isn’t the only site to feature such a post. Check out the last page in this month’s *DIY magazine… same thing, with VERY similar details. Anyway, it is a great idea and I’m sure lots of people will love having such a cute piece for their pup! Congrats, Kirsten! I absolutely adored this project, and I’m thrilled that it won. I love the way you re-used materials, and your attention to detail is what really makes this project shine. I just found this site and I’m having a great time reading it. And BTW, the photo of 1st place is too cute! not because of the dog (my fam has 2 mini doxies and trust me I am not a fan of the breed! ), but because it’s just plain fabulous! congrats Kirsten- you have a great eye for materials! Kristen – what a fabulous and easy way to spruce of the old dog bed! You have done an outstanding job and make this diy project seem very simple (to the non-so-diy-people like myself). Congratulations to you. Enjoy your winnings! Folks – HER bed has already been posted on that other website for sale for $100! What a compliment to her – shame on you nay-sayers! Ok, I would like to congratulate everyone who won. I am not thrilled with the first place winner however, but am soooooooo glad that the doll parts coat rack did not get first. I actually voted for the second place winner, too cool!!! I’m not trying to be negative about the dog bed, it just lacks that umph of a “look what I did”! I didn’t think it had a chance at 1st place. I think however if it weren’t voted on by us and a judge panel instead the vote would have been different. I think this is the Sanjaya of DIY. I am looking forward to the next contest however, hopefully there will be one soon. just a note- these were looked at by several of the people who work with d*s and we all agreed on the finalists. so the “panel” did in fact love this entry. i don’t think this is a sanjaya situation. Blake, come on, Sanjaya? That’s an unfair comparison. All of these projects demonstrated skill, talent and creativity. I think you should give credit where credit is do. If you can do better than you should send in YOUR project for us to see. Ok, guys, freedom of speech or opinion!!!! I think the bed is cute, but not “WOW” enuf. That is what I meant by Sanjaya of DIY, he was voted on by other things than his singing. AGAIN FOR THE RECORD, the bed is cute. I just think there were other entries worth first. Somehow I knew that ol “if you can do better”, would come up. Now, I actually wish I entered as planned, and will next time up. Just what we need, more controversy! To be honest, I don’t think my pets would touch a suitcase petbed with a ten foot pole, but congratulations to Kirsten nevertheless! 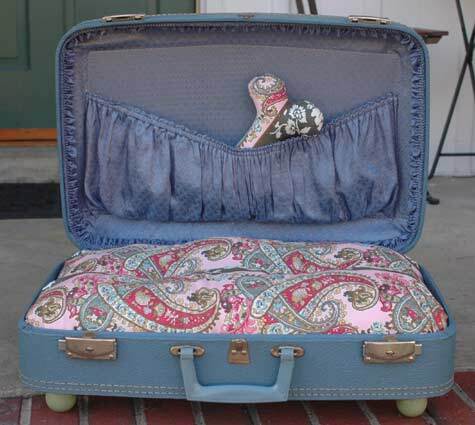 I think it’s adorable and a great way to reuse an old suitcase – congrats!!! Free speech is one thing, Blake but I think we all have a responsibility to speak as adults who can leave constructive comments. Sometimes I think people on this site just want to stir up trouble. Pamela please don’t be so touchy, I have the right to my opinion. Just get over it alright hun? Congrats to Kirsten and Grace for such a successful voting entry. I must admit that it wasn’t my favorite (I voted for the crib), but in the end it’s a matter of taste. I’m a more modern kinda girl. Nadja: completely agree with you! By the way, how many of you have old 1950s style suitcases in your homes? Yay my favorite won, Congratulations kirsten! Just a quick note- I think you guys both got your opinions across. Let’s keep things non-personal from here on out. It was the stuffed doll in the pocket and the happy dog that made this my choice. Congrats. Congratulations Kirsten!!! It’s adorable!! The dog is especially cute too. Everyone has an opinion and as long as it is constructive, I see nothing wrong. What’s with everything having to be a love-fest, lets be realistic you put something out there expect to get opinions, besides, I come to this site to see the comments because it is interesting to see the things individuals like and don’t like. I cannot believe this dog bed neat out that amazing George Nelson inspired chest. Grace your comment at the beginning of the contest about photos being important was right, People voted for the dog, not the bed. I’ll bet if The Nelson chest had a little kitten sitting in it it would have won. Anyway, at least this project is doable by anyone with two or one hand. An adorable idea! Portable too. Congratulations to everyone that entered and put the dedication and excitement into creating a DIY project :) That’s what this was all about right! Great job everyone! And Congrats to you Kirsten! 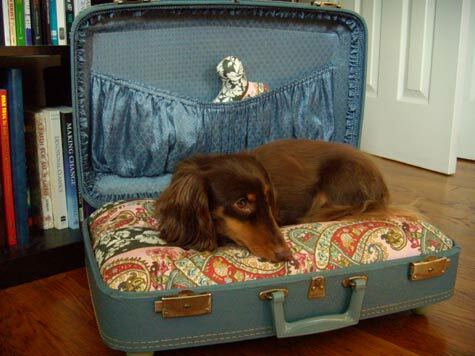 I appreciate the prospect of closing a suitcase to cover up a hair-covered pet bed when guests come over. I think I might still want to use the suitcase as a suitcase though (luggage is a little boring these days). The entries were all quite creative (and design spongesque), however, I will say that I was a bit disappointed that the contest instructions were so ambiguous. I would imagine that more than a few people worked quite hard only to find out that their pieces didn’t fit the criteria (I know I would have gone a MUCH different route had I known). Bottom line… it’s so wonderful to see design and DIY getting their day in the sun! And though some of the details may have ruffled some feathers it’s okay….it just shows how passionate people are about the topic. THANK YOU THANK YOU THANK YOU Chris and JS—you said it!!!!! This is what I was thinking but didn’t articulate like you did. It was kind of like grade school, when you worked hours on a Science Project only to find out the winners were the kids whose parents “did” the experiment for them or the person who did something that didn’t take a lot of effort, or it was the same ol’ same ol’ volcano explosion. Can you tell I’ve been there before, lol!!!??? I have DS as my homepage and look forward to it every morning with my coffee. So, yes I hold this site in highest regards and was a bit surprised, I guess I was just expecting to have my mind blown away from creativity as many of the entries expressed. I would like to see more of the type of thing that “Susannah’s Shelves” did. Taking a very expensive design – that most of us cannot afford – and translating it into something that we can make ourselves. Crafty stuff is nice, but I personally would like to see some more -DIY-rip-offs of cool high-end design pieces! Ok, I don’t see what on earth any of these projects have in common with “projects that people’s parents made”- when in fact everyone made these pieces on their own, by hand. I get it, you don’t think this was original enough to win, or that the entries weren’t what you were hoping for, but between the Sanjaya comment and the kids science fair comment I think you’re far from “lol” type comments and closer to just being mean to people who obviously put time and effort into work. If you have a problem with the contest you should email Design*Sponge rather than taking it out on the winners who did nothing but enter projects they spent a lot of time on. I love the dog,he or shes so cute!!!!!!!!!!!!!!!!!!!!!!! The dog bed not so much. I think that it needs more bright colors. I think the bed looks very cool. Good job! I was disappointed by most of the entries, though. (and also in the AT contest) Nothing knocked my socks off. Come on people! Be creative! NOT ONLY IS IT A RE-USE CREATION IT IS SO VERSATILE AND USEFUL TO USE AT HOME AND FOR THOSE WHO TRAVEL WITH THEIR PET. I just came across this and I have to say, I love this bed. I love the color and the idea. It’s sad that so many people have to put it down and bicker about it as if we were in “grade school”. Honestly, if you have nothing nice to say, just say it once and leave it at that. This is a project I actually want to do myself. Congratulations to the winner! Lighten up Pamela… sheesh. As if some contructive criticism cannot be said on terms of the contest as a whole. I like the dog bed. Great job. I know my cat would sleep in that bed. I think I will be making one for my cat. Then I will only have to clean one place from cat hair. Thank you for the good idea. I love this bed! I just thought it would be very important to note that you should NEVER keep Gorilla Glue anywhere that your pets will be able to access it. It is very delicious in a dog’s eyes, but if ingested, will cause serious problems requiring emergency surgery. Other than that, great project! I ADORE this. Great work Kristin!!! I posted this along with some more ways I found to DIY luggage here!